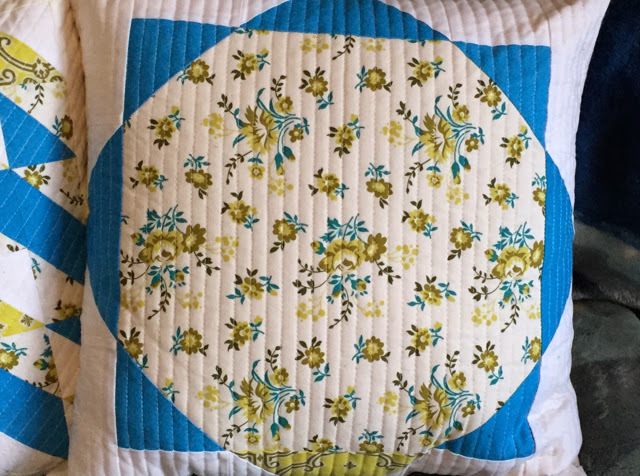 A few months ago, I started working on quilt blocks to make curtains for the island house. 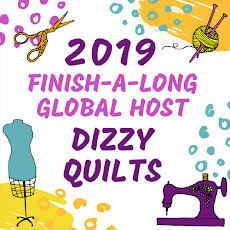 After making two of the blocks, and cutting one more, I decided I really wasn’t interested in making curtains out of quilt blocks so they sat on my cutting table. After cleaning up my sewing room one day, I pulled out the blocks and decided I needed to do something with them. My sweetie had just finished painting and moving the furniture around in the living room in the city and the new colours were pretty neutral – I needed a pop of colour in that room. My two orphan blocks would be perfect for pillows! 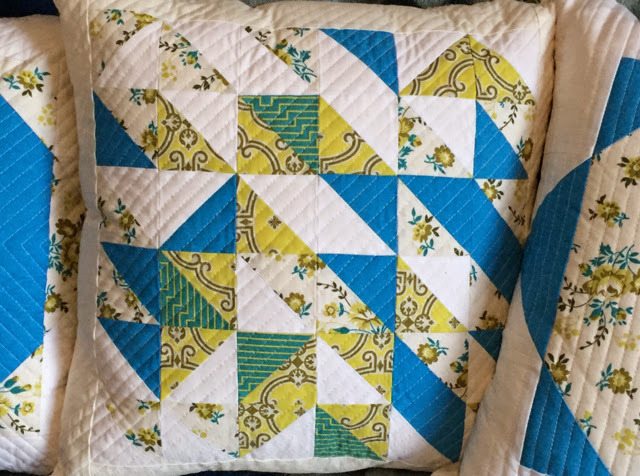 But I didn't want just two pillows, so I took the leftover triangles from the two blocks to piece HSTs and made a third one. 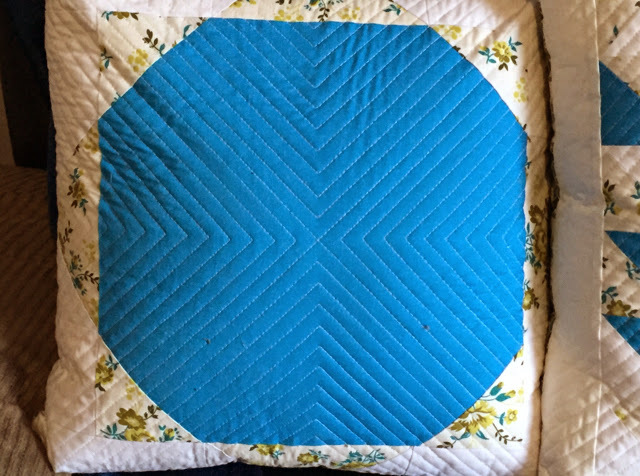 I quilted each pillow cover with straight lines using my walking foot. I didn't measure – I just used the sides of my walking foot as a guide for each line. The first one got vertical lines. The second pillow got straight lines on the diagonal. And for the third one, I used my Hera marker to trace one horizontal and one vertical line and echoed those lines to create a fun pattern. 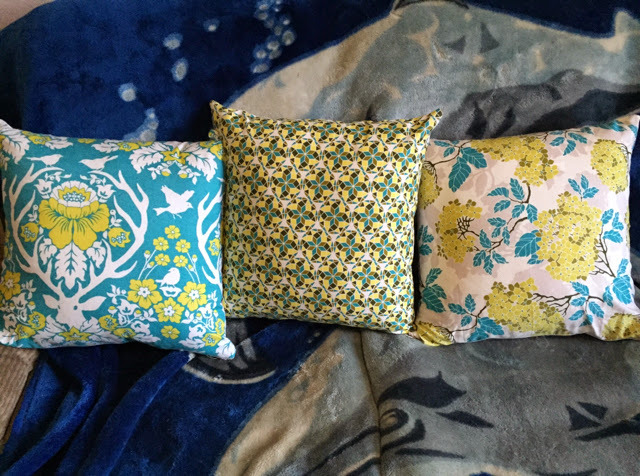 For the backs, I used Birch Farm fat quarters that match the fabric I used for the front of the pillows and put zippers in the bottom seam for easy removal – I have kids, a cat and a dog, these pillows definitely need to be washable! These pillows now add a touch of colour to the living room, which I love! 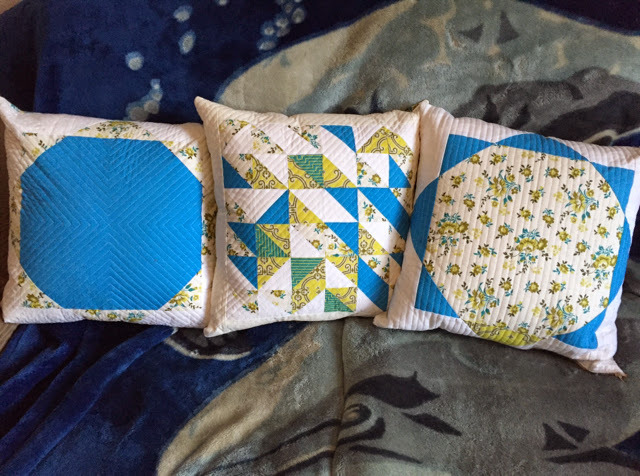 So if you have a few orphan blocks and you're not quite sure what to do with them, just turn them into pillow covers! 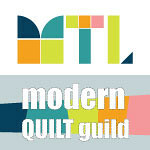 Linking up at Quokka Quilts for TGIFF.